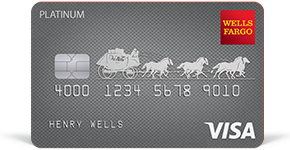 Read the Wells Fargo Platinum Visa Card Agreement. Certain restrictions and limitations apply. Review the Visa Guide to Benefits (PDF) to learn more. Overdraft Protection by linking your credit card to your Wells Fargo checking account, finance charges apply. See the full Terms and Conditions.